Over the years we've learned that the most effective route to solving a "pest problem" is through "people skills". Our goal is to connect with and reassure our customers. We listen to your concerns and communicate every aspect of our procedures. Our team is educated, articulate, compassionate and trained to put you first. We've been around for a while...over 30 years. Shepherd Pest Management has over 50 years combined experience in the pest control industry. We bring a strong and varied level of experiences in different types of pest control situations to our customers. Our company is not large but our "footprint" is. We provide pest control to some of the largest banks and property management companies in Texas. Yet, because we are a small family owned company, when you need to speak to the owner, he's only a phone call away. Don and Linda Shepherd own and operate Shepherd Pest Management. Don is a veteran of the United States Air Force with service in Southeast Asia and Viet Nam. 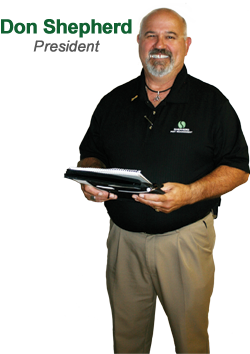 Don began his career in pest control in Louisiana in 1974. After relocating to Texas, Don established Shepherd Pest Management in 1980. He was determined to create a business marked by integrity, technical expertise and conscientious service to others. Don also sets Shepherd Pest Management apart with the creativity and intuitive thinking that is uniquely his. Shepherd Pest Management has been successfully reassuring, communicating, and connecting with tenants, managers, and homeowners since 1980. We effectively explain and communicate our services to anyone and everyone in your household or organization. We're not just about pests...we're about people! "I stand behind every job that we do. My name is on every truck and my personal promise is behind every job."